ST. PETERSBURG – The St. Anthony’s Triathlon staged an Olympic-distance event today for the first time since 2008, which means the 3,000 or so athletes on hand got to enjoy the event they paid for without weather disruptions for the first time since before the economy crashed. When an event is joint promoted by its health care provider owner and the World Triathlon Corp. (aka Ironman), which seems to be going through the motions with its second-annual 5150 series, it’s not surprising that it comes across as tone deaf to the economy. No wonder St. Anthony’s has gone from a race that used to sell out in December at nearly 5,000 athletes to one that attracts about 3,000 and does not sell out. That’s bad for Baycare and WTC, but awesome for the athletes. The event seems more manageable with fewer participants, though we’re not sure if moving the swim start north from Spa Beach to just beyond North Shore Beach had the desired effect of keeping athletes out of rough waters. In fact, athletes now seem to spend more time navigating the washing machine immediately in front of the Vinoy basin. 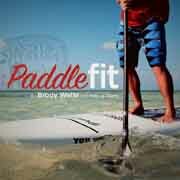 No wonder more than 80 percent of athletes wore wetsuits this morning. That’s a strange thing considering many Tampa Bay homeowners haven’t turned on their heat since February – of 2011. Air temperature was 75 when the pros went off shortly before 7 a.m. and well into the 80s by the time the last of the age groupers entered the water. Race officials announced the water temperature at 76.5 degrees, a wink-wink fudging of the numbers to ensure everyone, especially the hundreds of first-timers, could wear their wetsuits. It’s a sound strategy. I was among the idiots who swam without a wetsuit. Though the water was plenty warm, just as it was two weeks ago during the half-mile swim at the Escape from Fort DeSoto Triathlon 10 miles to the south where hardly anyone wore wetsuits, I paid the price with an extended stay in the Vinoy basin rinse cycle. The bike course is where St. Anthony’s has really improved because of decreased attendance. Putting nearly 5,000 bikes on a twisting, turning course through St. Pete more suited for the Honda Grand Prix was making things dangerous. But with just 3,000 cyclists, it’s much safer. St. Anthony’s always does a great job with volunteer support and it doesn’t seem they’ve cut there even as registrations have dropped. Having endured a few Baycare medical bills in the last 15 months, we’re confident St. Anthony’s can get by with “only” 3,000 athletes. Ditto for WTC, which seems unwilling to admit that the 5150 branding of Olympic distance races was just a bad idea. 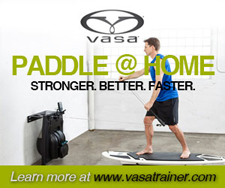 Even many avid triathletes can’t explain the 5150 specifics, especially in a year involving a Van Halen reunion tour. We’ve never understood the odd relationship between WTC and Baycare. The 5150 series, which didn’t gain any fans in these parts by canceling the inaugural year-end race in Clearwater in November, only further blends two polarizing brands. WTC has gotten into the habit recently of canceling events that don’t meet registration expectations. The M-Dot doesn’t hold that kind of sway over St. Anthony’s and even if it did, we hope that wouldn’t happen, even if registrations drop another 20 percent in 2013. After all, it seems the smaller St. Anthony’s gets, the more enjoyable it becomes for the athletes. Tagged as 5150 Series, Baycare, Pete Williams, St. Anthony's Triathlon, World Triathlon Corp.
WASHINGTON – There’s something cool about having much of the downtown mall shut down early on a Sunday morning for a few thousand triathletes. As someone who grew up in Northern Virginia and accustomed as a young professional years ago to taking long runs around the monuments and the U.S. Capitol building, I was skeptical about how DC Triathlon race directors could pull off the logistics of staging an event in a market with the nation’s worst traffic. Swimming in the Potomac did not sound pleasant and getting into the city the day before to put bikes in transition didn’t seem worth the effort. But after watching Sunday’s event, which consisted of sprint and international distance races, I’m ready to sign up for 2012, even with the rapidly escalating fees now that the race has become part of the overrated 5150 series, which apparently refers to adding $51.50 to the entry fee to have a loose association with Ironman. The World Triathlon Corporation, owners of the Ironman trademark only as it pertains to triathlon, can be mostly blamed for the escalation of triathlon entry fees. The WTC’s recently-announced Ironman event for 2012 in New York City ($1,000 and up) no doubt will trickle down to other events, including the DC Tri, which is $110 for the sprint and $165 for the international for 2012. That “alumni” rate factors in a $25 consideration to returning athletes, so expect a staggering $135/$190 entry fee for newcomers, not including registration fees. Is it all worth it? Probably – especially when you compare it to Florida’s own St. Anthony’s Triathlon, now the second event of the 5150 series. 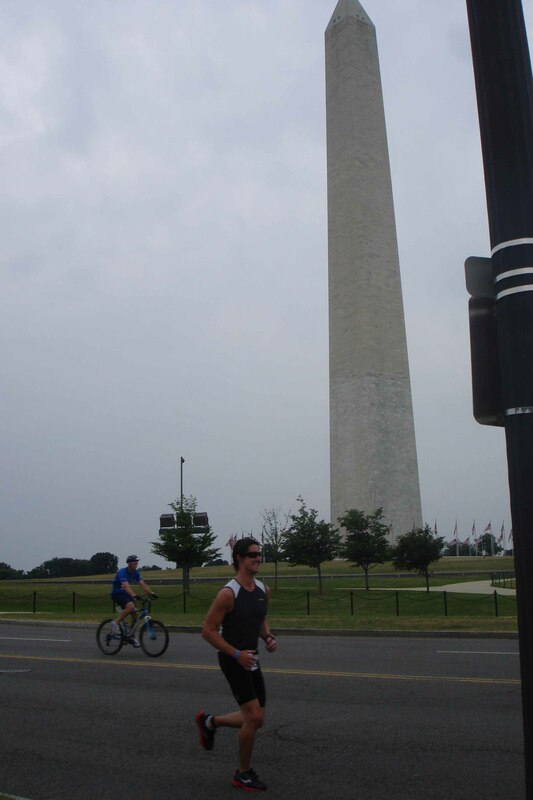 The course goes around the Washington Monument, Lincoln Memorial and the Rock Creek Parkway. Given DC’s legendary humidity, I thought athletes would be suffering. In fact, the opposite was true. Athletes enjoyed low 70s temperatures and nearly everyone finished by 9:45 a.m. – unlike the St. Anthony’s overheated, 4,000-athlete death march that continues well into the lunch hour. As for swimming in the Potomac, it couldn’t be any calmer. St. Anthony’s, meanwhile, hasn’t pulled off a swim not marred by weather since 2008. In an interesting twist, the DC Tri started the pros at 9 a.m. It’s hard to think of another race that lets the age groupers start first. 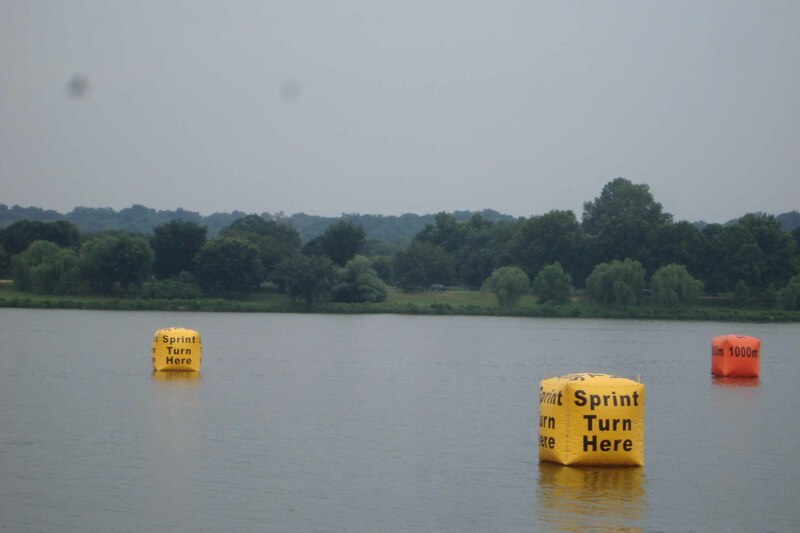 As for logistics, the DC Tri might have fewer headaches than St. Anthony’s. After all, you can take the Metro into the city – with your bike – and I saw a number of athletes headed home on the Metro with their carbon fiber. 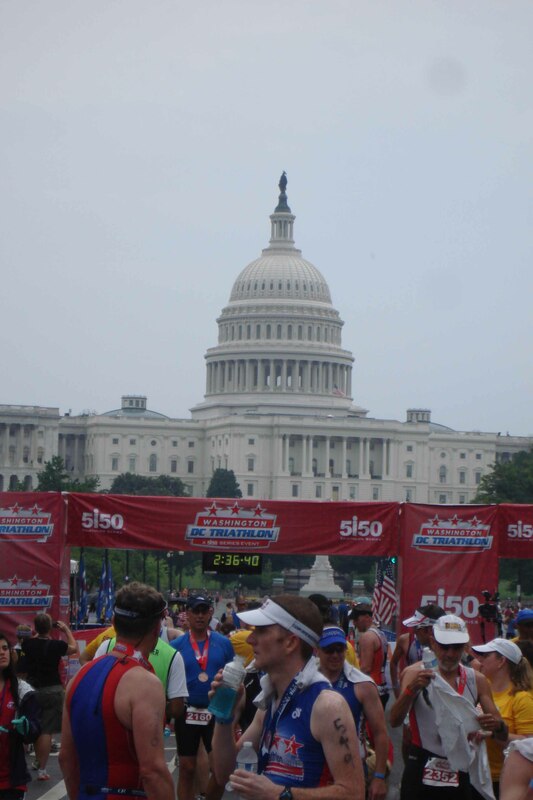 The finish line was near the U.S. Capitol building – making for great pictures and a terrific setting – and there were regular buses taking athletes back to transition. The medals were stunning — giant pennies. The elephant in the living room, of course, is getting into DC, a brutal test of endurance if you’re driving from out of state and coming in via I-95 or 270. We noticed a lot of carbon fiber inching along next to us as we approached DC early Friday afternoon – stuck 30 miles south of the Beltway. 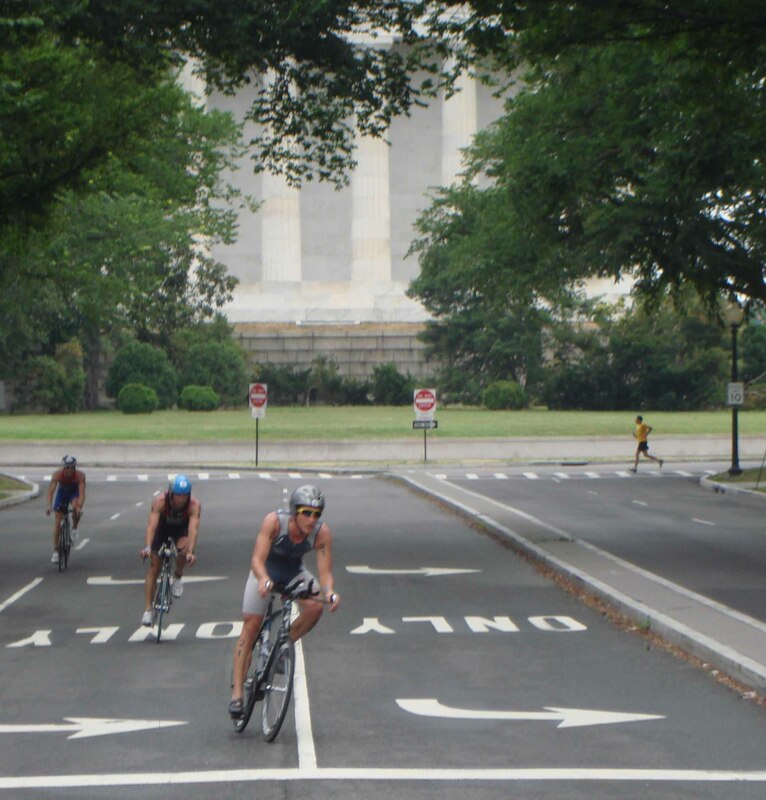 That aside, I’m bullish on the DC Tri for 2012. Did St. Anthony’s Find its Mojo? 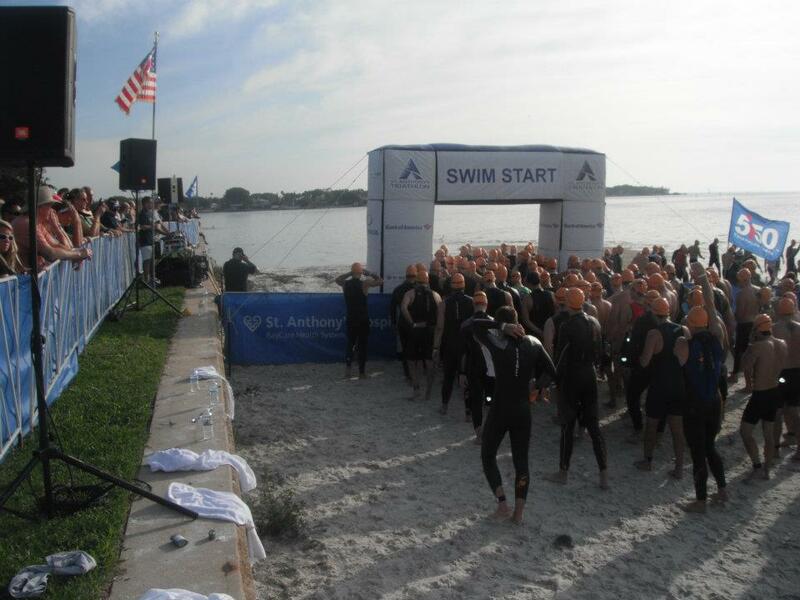 The folks who organize the St. Anthony’s Triathlon can make it a difficult event to like. In recent years, it’s grown so big that it becomes a weekend-long ordeal to race, with those in the latter waves waiting more than three hours from the time they arrive in transition until they get in the water. For all of the sponsors and massive financial resources of the organizers, the goody bag and schwag is modest and the shirt has dozens of logos on the back, which means no women are going to wear it. Despite a bad economy, race fees have gone up in each of the last three years and, when combined with the mandatory Active.com ransom, soon will approach $200 for an event that technically has not been an Olympic-distance triathlon since 2008. Sure, nobody can control the weather. But between the cancellation of the swim in 2009, the shortening of it for the latter waves last year and for everyone on Sunday, it makes you wonder if the triathlon gods aren’t trying to send a message. St. Anthony, after all, is the patron saint of the poor and travelers. Now BayCare, the Tampa Bay healthcare juggernaut that owns the event, has partnered with World Triathlon Corp. to make St. Anthony’s part of the 5150 series, Ironman’s latest brand extension. 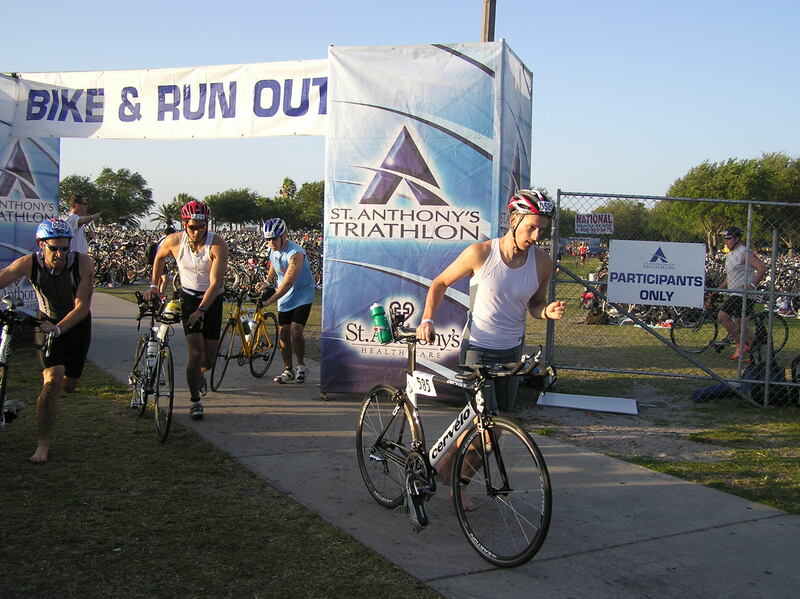 But a funny thing happened on the way to St. Anthony’s alienating even more triathletes in 2011. It accidentally stumbled upon a winning formula. Because of declining attendance – Sunday’s race featured about 3,200 competitors, insiders say, as opposed to the 5,000 that race organizers continue to announce as if it’s still pre-recession – it’s actually a much more manageable and enjoyable event for everyone. By tweaking the swim to 1,000 meters (down from the 1,500-meter standard) and shifting it toward the beach in front of the North Shore pool, away from the rougher waters in the Vinoy basin, they’ve found perhaps a better swim site. Any reason why that couldn’t become a permanent change of locale? It would be nice to see St. Anthony’s freeze entry fees for one year or even offer a $15 discount to recent customers. Imagine if you made your St. Anthony’s debut in 2009, swam in a latter wave in 2010, and showed up again this year. You’ve spent about $500 in entry fees, still haven’t done an Olympic-distance event, and must feel like Charlie Brown trying to kick Lucy’s football. It’s also interesting to note that far fewer people have made the trek down from Atlanta in recent years. The debut of the popular Augusta 70.3 event in 2009 no doubt made a difference, along with the economy and the addition of other races. The greater competition in the industry means St. Anthony’s no longer can hope to have unbridled growth every year. Perhaps that’s not a bad thing. Longtime triathletes reminisce about when the event was 1,500 people. It seems like the smaller St. Anthony’s gets, the better. Tagged as 5150 Triathlon series, shortened swim, St. Anthony's Triathlon, World Triathlon Corp.